"Indivisible," which organized protests around the country against the president, has written a 'how-to' guide for a progressive agenda in Congress. WASHINGTON — Indivisible, the grassroots movement at the center of opposition to President Donald Trump, taught its activists how to influence lawmakers from outside of power with an online guide in late 2016 based on the tea party's tactics under Barack Obama. Now the "resistance" group is looking to prepare its members for life under divided government. Indivisible's approach two years ago went viral, local chapters popped up around the country and its members helped fuel a Democratic takeover of the House in the midterms. The updated sequel, a guide to "Indivisible On Offense," looks to instruct progressive members on the power that comes with Democratic control of the House and how they can maximize it. "I was calling Indivisible leaders around the country to thank them this week and the dominant theme was 'Okay, but what are we doing next?'" Leah Greenberg, a co-founder of Indivisible, told NBC News at a gathering in Washington for newly elected progressives. The the new guide includes detailed advice on pressuring members to investigate Trump, but also on how to potentially confront Democratic leaders to secure concessions in what Indivisible calls "must-pass bills." In a preview of how the emboldened grassroots wing might operate, Rep.-elect Alexandria Ocasio-Cortez, D-N.Y., joined climate protesters in occupying Minority Leader Nancy Pelosi's office on Tuesday. The two exchanged kind words on Twitter, but Ocasio-Cortez's demands were more than symbolic: She pushed for a plan to combat climate change by 2020 drafted without input from Democrats who take donations from the fossil fuel industry. 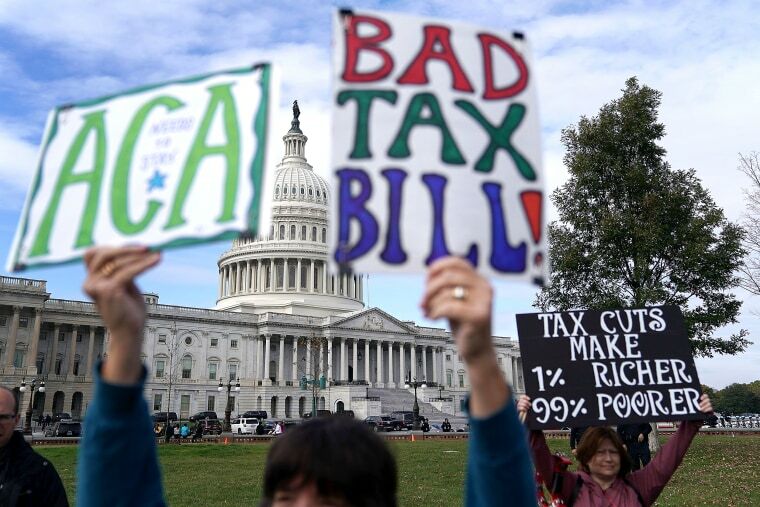 "In 2017, they organized against Trumpcare, they made the Republican tax scam a liability," Ezra Levin, a co-founder of Indivisible, said in an interview. "In 2018, they registered voters, endorsed candidates and got out the vote. In 2019, they're going to be holding those same representatives accountable." The tea party movement and its legislative bastion, the House Freedom Caucus, again figure prominently in the guide. The hope is to replicate their success in influencing legislation while avoiding some of the movement's stumbles after their own wave election in 2010. Part of that approach could mean standing up to Democratic leaders, but it also means managing expectations. The tea party frequently battled Republican leadership, sometimes forcing them to negotiate with Democrat members on spending bills, in part because activists became convinced they could repeal Obamacare with a Democratic president and Senate. Those tensions peaked in 2013 when conservatives forced a government shutdown in an unsuccessful attempt to defund the Democratic health law. The new guidebook doesn't dwell on how high activists should aim, but it devotes a lot of space to distinctions between "messaging bills," which are designed to build support for future policy goals and put Republicans on record opposing them, and must-pass bills like spending legislation, where members can withhold votes to force more modest policy changes. "We talk to people realistically about what's going on, what we think is possible now, and what we think will take time to accomplish, and that's a core philosophy that animates the guide," Greenberg said. There's plenty of material on the Democrats' new power to investigate the White House through subpoenas and hearings, which leaders say is likely to be a big driver of activist engagement. The authors write that members should "demand nothing less than Democrats using their oversight authority on Day One to obtain Trump’s tax returns," while also pressuring lawmakers to investigate potential cabinet-level scandals in the relevant committees. Once again, there are some notes of caution, with a section on impeachment warning that it's likely out of bounds unless Trump's political support collapses and investigations producer stronger evidence. While the guide says Indivisible supports opening impeachment proceedings on principle, it adds "we also recognize that impeachment is not a matter of whether someone objectively deserves to be impeached; it's a matter of whether the votes are there."